The Apartment is semi-modern, pleasant, spacious, self-servicing, non-smoking, and each consists of 2 bedrooms (1 queen-size & 2 single beds), lounge/dining room with 2 double sleeper couches (pull-out sofa beds), have free Internet/Wi-Fi, TV with free M-Net & DSTV Hotel Bouquet ("Cable TV"). 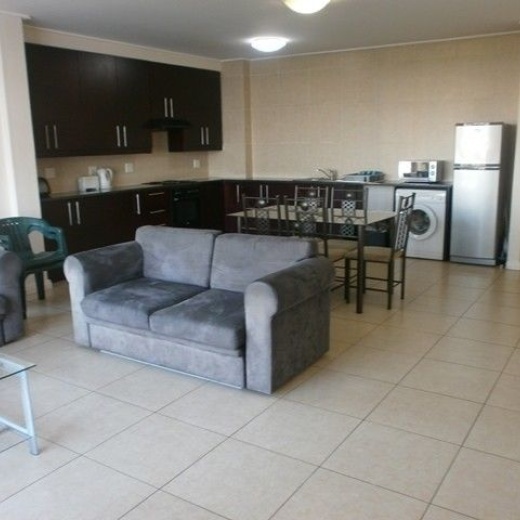 Each apartment has a fully equipped self-catering open-plan granite kitchen with washing machine, main en-suite bathroom with bathtub, second en-suite bathroom with walk-in shower, pleasant scenic front and wrap-around balconies, and two reserved under-cover parking bays. The apartment is a stone’s throw from the V&A, trendy Old De Waterkant, Cape Town International Convention Centre, the CBD’s office towers, internet cafes, the famous bustling Greenmarket Square with its flea market and museum, the world-famous Mandela-Rhodes Place development and winery, the historic Government Lane & Company Gardens botanical gardens with huge museum and houses of Parliament. Also near by; The Castle of Good Hope, The Bo-Kaap & Malay Quarter, lively Long Street with its vibey shops & throbbing night life, relaxing St Georges Mall, Adderley Street, & Van Riebeeck Square.